Milk Kesari is a rich for of normal Kesari where rava is cooked inside milk to make it more delicious. Kesari is a South Indian dessert called by diverse names in each states. In North they call it as Sooji Halwa, Rava Kesari in Tamil and Kesari in Telugu and Kesari Bhath in Karnataka. Though it is called with various names all the recipe basics are similar. Generally kesari is prepared with water or milk, saffron for colour and cardamom for flavour. Some use fruit flavours such as Pineapple Kesari, Mango kesari using fresh fruits or fruit essences. This kesari can be prepared using artificil powder or liquid colours or with natural cours like Saffron, Turmeric dissolved in milk. Quick and versatile traditional recipe. In a pan add two teaspoons of ghee and fry the cashews once it starts to get golden colour add raisins and fry them till it puffs up and remove them from ghee; Set aside. In the same pan with remaining ghee add the rava and roast the rava till light golden colour appears. Boil the milk in a wide pan while boiling take two teaspoon of milk and add with the food colour; allow to dissolve uniformly if the food colour is liquid or powder. Once the milk starts to bubble add the roasted rava and stir well. In this stage you have to be careful stir well while cooking to prevent forming lumps in kesari. Once the milk is absorbed the rava get cooked and starts to thicken. Now add the sugar and mix well. In this stage also chances are there to form lumps. So constant stirring is essential. The sugar loosens the cooked rava and when you cook further it starts to thicken again. Add the cardamom and ghee at this stage. Mix well the kesari will not stick to the pan and comes together. Now divide the kesari into three equal portions. Keep a portion inside the pan and remove two portions from the pan in separate bowls. Kesari which is inside the pan, add the green food colour which you dissolved earlier and mix wll till the colour uniformly distribute all over the kesari. Use a touch of ghee if needed. Once the colour coats well, remove the green colour portion from pan and set on the cups as first layer and flatten the surface with a backside of the spoon dipped in ghee. Then keep white layer, set one colourless portion you set aside in bowl and flatten the top. Then keep the remaining colourless portion inside the pan and add the orange food colour and mix well to coat uniformly add a touch of ghee if needed. Transfer this ontop of white layer and flatten the surface. Garnish with fried cahews and raisins on top and serve. 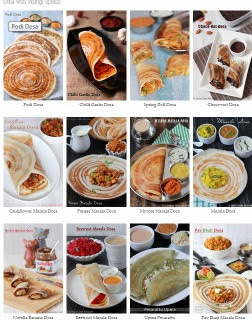 I am linking this recipe to the Event Independent India conducted by Cooking with SJ. this is awesome dear...kesari looks just amazing.. Such an inviting........ Looks fabulous dear! Happy to see the tri- color in a kesari form . 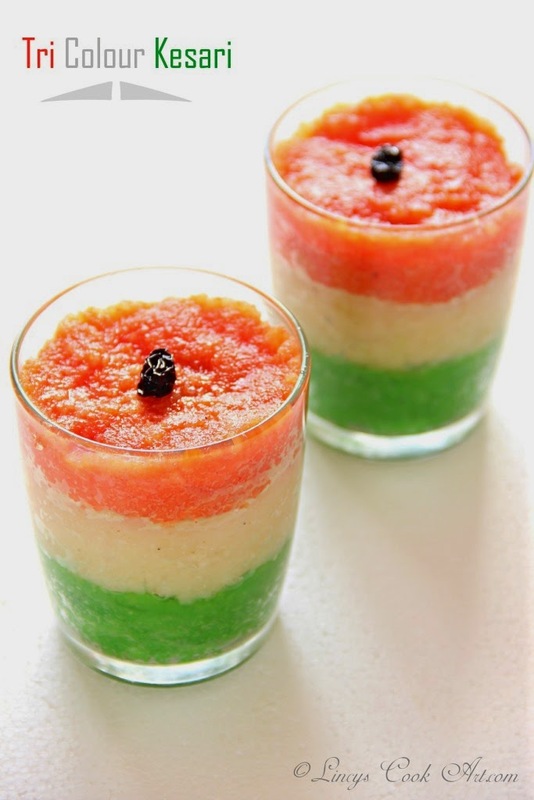 Very elegant tri colour kesari. Wonderful tricoloured dessert. Happy Independence Day to you dear. Colorful kesari, love it to have anytime.. It's looks awesome and delicious.. Happy Independence Day Lincy..